Please, PLEASE if you are having an outdoor wedding at dusk, provide some mosquito spray to your guests. Or better yet, hire one of those services to come and spray the location the day before. Everyone is miserable when they are covered with a zillion mosquitos! We have even picked out mosquitos that have been caught in the bride's veil. How romantic. So if you have been one of the loyal and avid readers of these posts, you know that so many things can pop up during your wedding planning and on the day of. Things that you might not ever think of unless you go to a lot of weddings and hang out in the background. We do. We see most everything that happens - the good, the bad and the ugly. Just the other weekend, the band was complaining about their stage not being big enough and not having the electrical requirements that they needed. How's your knowledge of power requirements??? I don't know about you, but on my wedding day I wanted to be the bride, not an electrician. What if you change the time you want to leave your reception? Who is going to have the number of the car company to tell them the new time? Sure you have it in your wedding book, but where is the book? Short a corsage from the florist? You can't leave that one grandparent without something to wear! Who is calling the florist??? Who is stressing about this? You will be! Imagine the photographer trying to take all of the family pictures, but where is the family? Uncle Bob is over there, Aunt Sally is still getting ready, Aunt Sue went to sit down in another room. Who will be yelling trying to get everyone to be in the same room at the same time? Yep, you again. There was one reception that I heard about where the venue had to make a rain call while the ceremony was taking place at a nearby church. No big deal, right? Well the florist was already set up and wasn't made aware that the rain call had taken place and everything (but her flowers) were moved inside. Fortunately she decided to run back by the venue to double check everything 30 minutes prior to the guests arriving. 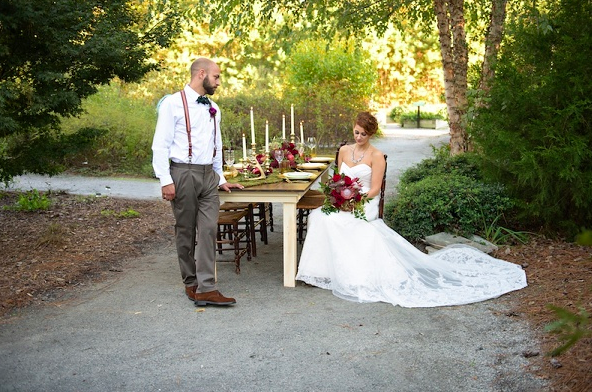 She was able to redecorate everything before the couple arrive for their reception. I wonder what you can do to help ensure that these things don't happen? If the couple had hired a professional wedding planner, none of this would have been an issue. Don't make your friends, your mother, (or you) have to deal with this stuff. You don't want to be interrupted while you are taking pictures or getting dressed in your beautiful wedding gown - hire a professional wedding planner to handle everything for you. You will just have to trust me on this one - it will be worth the money!!!! By the way, each of the examples are from an actual wedding. We even had one this past weekend where the reception site's power was knocked out by a storm right before the wedding. No power, no AC, nothing for the entire night. Who do you think had to deal with that? We are videographers. We are cinematographers. We are film makers. We are video ninjas. Whatever you want to call us, fine. We are passionate about the work we do. The work speaks for itself. When you are searching for a videographer (and you should be!!! ), look for someone that you connect with. I feel that you should have an emotional reaction to our work. Brides call/email us crying because they just watched the clips on our website. That’s an emotional reaction. Our brides actually LOVE their wedding film more than their photos most of the time!! I know, you can't even imagine that now, but it will happen. That's the part that makes me so crazy. Just trust me and let us do our job. I hear it over and over from bridesmaids and others. "I just got married last month and I didn't hire a professional videographer for my wedding." It's unfortunate because you can't go back and redo your wedding day. If the company you hire knows what they are doing then you are going to get a priceless treasure from your wedding day. A few years ago a bride's grandmother got very sick the day after the wedding and never recovered. We had captured some great footage of her at the wedding. We were able to use every piece of usable footage as a tribute to her grandmother. We even had natural audio of her grandmother laughing. I don't know if you have ever lost a loved one, but to be able to remember how they looked and sounded is such a gift. The above example was used to help you understand that a wedding video not only will capture the things that you understandably find important - your wedding ceremony and vows, your first dance, the funny moment during cake cutting - but it will also capture the things that you might not realize how very important they will become. We recently saw the best arrangement for the parents during the wedding ceremony. To better help you understand what I am talking about, this was a formal church ceremony, the groom's father was the best man, and there wasn't a center aisle. So both sets of the parents (bride and groom's) were sitting on the same aisle. But instead of being on the sides, they both scooted to the middle and sat next to each other. How great is that! We think it showed a wonderful sense of unity between the families. Some brides and grooms are not as lucky. And besides for a lot of weddings, the groom's mom has to sit by herself because her husband is standing with their son on the alter. Great for pictures and video too! This tip is actually another one of John's. Don't we love it when he chimes in from time to time! John says to not make any major decisions - like buying a dress, booking a venue, etc., the first week after you get engaged. Take a little time to enjoy your new sparkly ring. There is so much excitement right after an engagement, but don't let that excitement cause you to make bad decisions. Booking the first venue you see, or the first dress you put on because you just sooooo excited and can't wait to start getting ready for the wedding, it might turn out to be a bad thing. Take the time to make an educated decision so that you won't have any regrets. I doubt many venues or dress shops will give you a refund if you change your mind. And you know what else would help...hiring a professional wedding planner. They will be able to lead you in the right direction! AND save you money in the process! It is clear that I don't read all of the wedding websites out there - I really have no need. But I think this might be an original idea. Most sites might have too much class to cover this topic, but I feel that it is vitally important. Whether you like it or not, you and your groom are responsible for getting people out on the dance floor. Well, at least partly. You can have a great band or DJ, but your guests want to see you out there having fun. I am not saying that you have to physically drag everyone and force them to dance. We have seen when planners guide their couple to the dance floor, the guests start to dance. When they see you having a great time and dancing, they want to come out on the dance floor too. One more bonus: Your photographer and videographer can capture some great memories because everyone is out there dancing and having a great time! Insider's Tips: Tip #39 - Who really wants all of that leftover cake? Quick and easy tip of the week: The later in the wedding reception that you cut your cake, the less will be eaten. A lot of the older crowd will leave once the cake is cut, so your crowd will thin out just a bit, but do you really want 5 layers of cake in your mom's freezer? So why not have your introduction, go straight into the first dances (bride and groom, daddy and daughter, mom and son) and then go cut your cake. Then you can party with the band and do what you want to do!